Jess's Many Mini Adventures in Food and Farming: Here we go again. Peter was at the post office when it opened to pick up our 123 new chicks. Lucy and I were on "mom" duty for the day, checking on our broods every hour to monitor the temperature in the hoop houses out on the pasture. 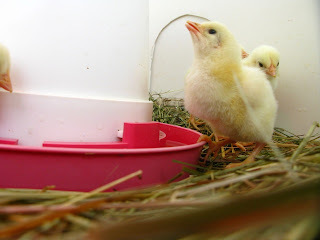 Baby chicks need to be kept at 90 degrees for the first week or so of their lives, which means a lot of raising and lowering of heat lamps and opening and shutting of the vent flaps on the side of our hoop house. The very first thing we had to do, though, was teach the little ones how to drink. 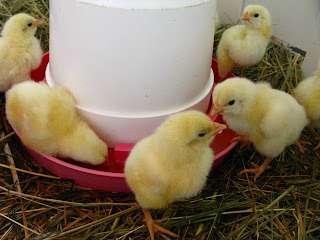 Each chirpy fluff had to be carefully lifted out of the cardboard mailing crate, dipped beak-first, carefully in a water tray, and then placed in the enclosure with its mates. The little guys and gals haven't had a drop to drink since their hatching the day before and this little baptism ensures that they get the idea of H20 and don't get dehydrated. Our birdies got the idea all right, and were soon hopping over one another to splash into tiny water trough like hot little kids in a fountain in summer. Once in, they dip their little beaks down, scoop out a few drops, then throw their heads back to gulp gulp gulp. 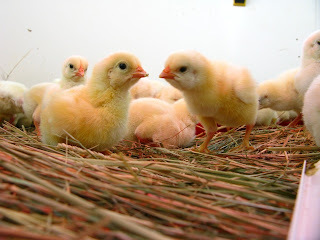 This week we have temperatures in the 80s, which is good, because in our last batch, 3 little birdies who got too wet in the trough ended up with fatal cases of hypothermia. They really are adorable, but it's easy not to get too attached since we're now all-too-intimate with where they'll eventually end up. Oh man, they are so cute.